Even though it isn’t Sunday yet, and the temperatures are starting to warm up, it’s always a good time for vegan chili. 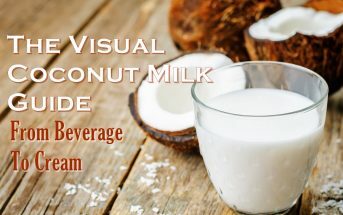 This very healthy recipe was shared with us from Blissful Basil: Over 100 Plant-Powered Recipes to Unearth Vibrancy, Health, and Happiness by Ashley Melillo. Blissful Basil is a stunning cookbook that is meticulously designed with warm feminine touches, pretty photographs, detailed but organized recipes, flowing introductions, ample helpful notes, and special diet icons. Yes, Ashley truly covers it all with the style and grace of a professional hostess. But the recipes themselves have a natural, rustic quality, much like this vegan chili. 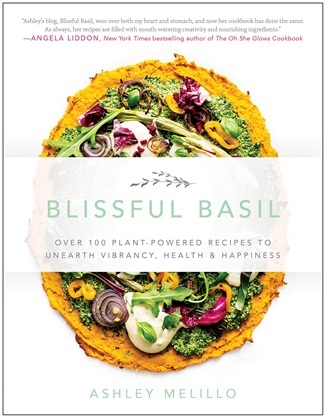 To note, Blissful Basil is a purely vegan cookbook and it’s nearly entirely gluten free. 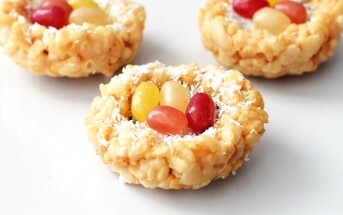 There are also ample soy-free and nut-free recipes with substitution options wherever possible. This chili requires just 15 minutes of active prep time and then you can sit back, relax, and occasionally give it a stir. It’s the perfect meal to have simmering in the background on a lazy Sunday afternoon while you binge-watch House of Cards (Frank Underwood, you scare me, but I just can’t quit you). This chili garners its meatiness from walnuts and sun-dried tomatoes that have been pulsed into a crumble and sautéed with onions, peppers, tomatoes, beans, and an array of spices. Balsamic vinegar and tamari deepen both the flavor and the color of the chili. The balsamic enhances the complexity of the chili’s acidity and mingles with the tomatoes in the loveliest of ways, while the tamari adds an enticing umami quality. A lengthy simmer time melds the flavors together, and then it’s time to serve. 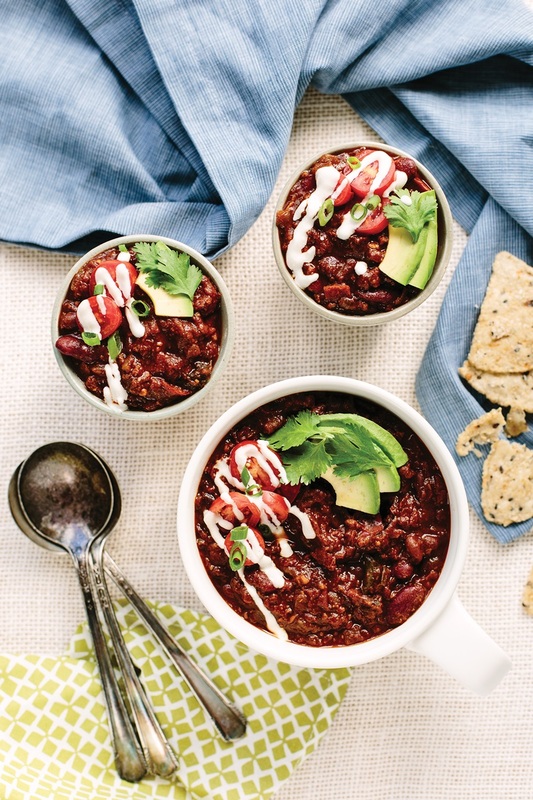 Spoon this chili into bowls, pile on the toppings, and serve with a hefty handful of tortilla chips for dipping! Heat the olive oil in a large stockpot over medium heat. Add the onion, red peppers, and poblano pepper, and sauté for 6 minutes, or until the peppers are just beginning to soften and the onions are generously flecked with golden-brown edges, stirring occasionally. Meanwhile, add the walnuts and sun-dried tomatoes to a food processor and pulse 30 times, or until roughly minced and crumbly. Transfer to the stockpot along with the garlic, chili powder, smoked paprika, cumin, oregano, sea salt, and coriander. Decrease the heat to medium-low and sauté for 4 minutes, or until the spices are wafting a rich, toasted scent, stirring frequently. Add the whole peeled tomatoes with juice and bring to a simmer, using a spoon to thoroughly crush them to the desired size as they heat. Add the kidney beans, black beans, and water, and continue to simmer for 5 minutes, stirring occasionally. Then, stir in the balsamic vinegar, tamari, and maple syrup, and decrease the heat to medium-low. Partially cover, leaving the lid askew, and simmer for 30 minutes, stirring occasionally to prevent burning. Cover completely and continue to simmer for at least another 45 minutes but preferably 1 hour or longer, stirring occasionally to prevent burning. Taste and season with more sea salt, if desired. Ladle into bowls, layer on the toppings, and get cozy. Refrigerate leftovers up to 4 days or freeze for up to 1 month. No Oil? No Problem. To keep this dish oil-free, opt for vegetable broth instead of olive oil. No Nuts? No Problem. To keep this dish nut-free, use raw shelled sunflower seeds instead of walnuts and do not use the cashew sour cream. No Soy? No Problem. To keep this dish soy-free, swap out the reduced-sodium tamari for coconut aminos. Leftovers? 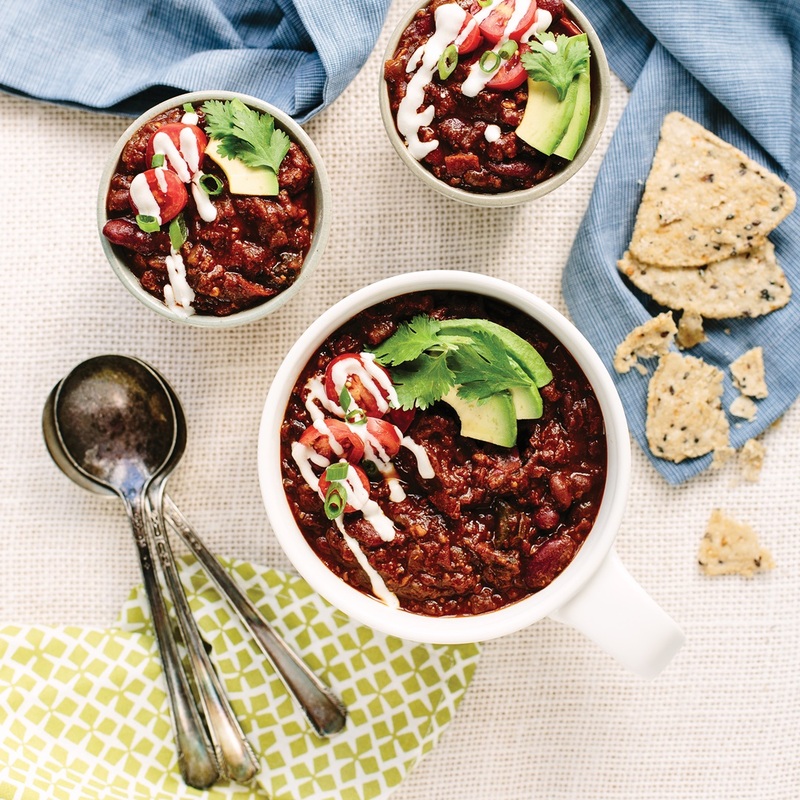 This chili is even better on the second day after the flavors have mingled overnight! 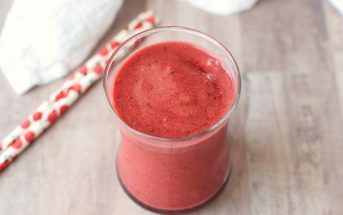 This recipe with photo was reprinted with permissions from Blissful Basil: Over 100 Plant-Powered Recipes to Unearth Vibrancy, Health, and Happiness by Ashley Melillo. I have sun-dried tomatoes packed in oil. Can I use those? Or must they be dry? Sorry I didn’t see your comment earlier Angela. I think those will be fine. When I think of vegan chili I them meh! But oh man, I bet the sundried tomatoes take this chili over the top! Agreed, this is a unique one! This looks delicious! Might not be Sunday but it would be great for a Meatless Monday too! You are speaking my language: easy!!! I love chili because it’s a great option for when you’ve got meat eating friends, they often don’t realize it’s vegan. This color! 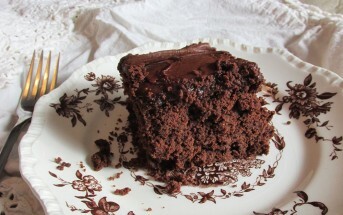 This looks so amazing, just like the rest of your recipes! That chili looks amazing! I’ve never put walnuts in my chili! Easy does it sounds like my kinda Sunday. 🙂 These looks absolutely delicious! This chili looks amazing. Hearty and flavorful. I’m always looking for new chili recipes – even in the summertime! I love that this one uses poblano pepper. Definitely trying next weekend!